Quality local Amish made leather night latch enables a more secure emergency grip for the rider and is perfect for attaching the saddle strap attachment to the coiled wire when riding with the Hit-Air vest. The Night Latch comes in black, light brown, medium brown and dark brown. Directly below is the light brown Night Latch with the Hit-Air Coiled Wire (Advantage style) attached to a hornless saddle. We also refer to the Hit-Air Coiled Wire as a "tether" or "lanyard"; this is the black elastic strap that is looped through the Night Latch below. The middle photo is the dark brown Night Latch on a saddle with a horn. The bottom photo shows a black Night Latch. 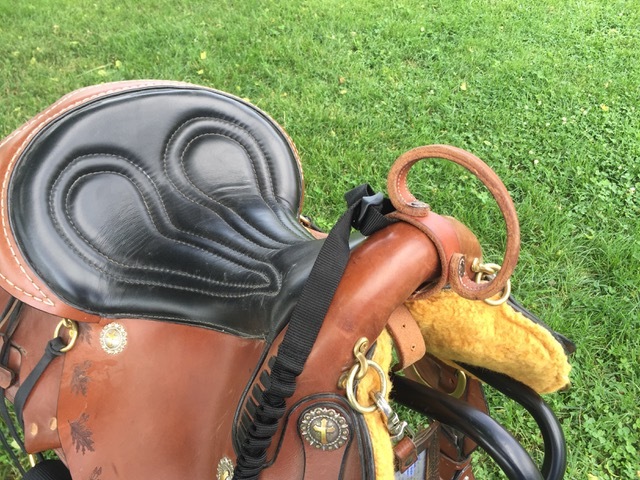 We prefer hornless saddles due to added risk of injury from the horn and it can become entangled with the rider's Hit-Air vest (especially the buckle version).